Toronto Mayor Rob Ford turned back after landing in the US last week, shortly after he announced he was entering rehab, say media reports. The Canadian consulate said Rob Ford “voluntarily withdrew” his request to enter the US after talks with border officials in Chicago. 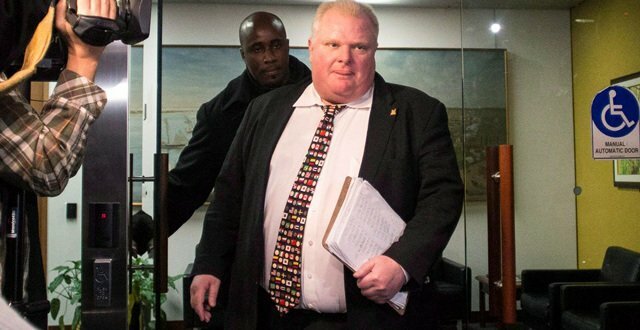 Rob Ford’s lawyer and brother have said he is now in treatment for substance abuse, but they refused to say where. He admitted to using crack cocaine in a “drunken stupor” last year. Rob Ford has already been stripped of many of his mayoral powers but refused calls to step down, running for re-election in October. The embattled mayor announced he was starting a 30-day treatment course on Wednesday. The following day, he boarded a plane in Toronto and flew to Chicago. Roy Norton, the Canadian counsel general in Chicago, told the Globe and Mail Rob Ford had “voluntarily withdrew his application to enter the US” and was “not denied entry, per se”. He told broadcaster CBC Rob Ford turned back after “discussion” with US border officials. On Tuesday, Councilor Doug Ford confirmed his brother was in a treatment program but would not say where. “Yes, for the one-millionth time, Rob Ford is in a rehabilitation program,” Doug Ford said, adding if he identified the location, he feared media organizations would stake it out. Doug Ford refused to comment on what happened when his brother landed in Chicago. The mayor’s lawyer, Dennis Morris, also refused to disclose his client’s location but said the “bottom line is he’s in rehab”. “He’ll be there for a number of weeks – and that’s the answer,” Dennis Morris told the Globe and Mail. Rob Ford has visited the US this year, going to Los Angeles and appearing on a chat show earlier this year. Deputy Mayor Norm Kelly will serve as mayor during Rob Ford’s leave of absence.